Click the button below to add the MMP-MS4448PAE Pre-Wired Magnum Power Center 4400W 48VDC 120/240VAC to your wish list. Pre-wired and tested Mini Magnum MS4448PAE Power Center is ready and waiting on our shelves to be shipped out. It comes equipped with a Magnum Energy MS4448PAE 120/240 sinewave inverter, a Mini Magnum Panel pre-assembled with necessary components. The Power Panel is a necessary part of an inverter installation. The battery and inverter's Circuit breakers and the remote control mount on the front of this electrical cabinet. 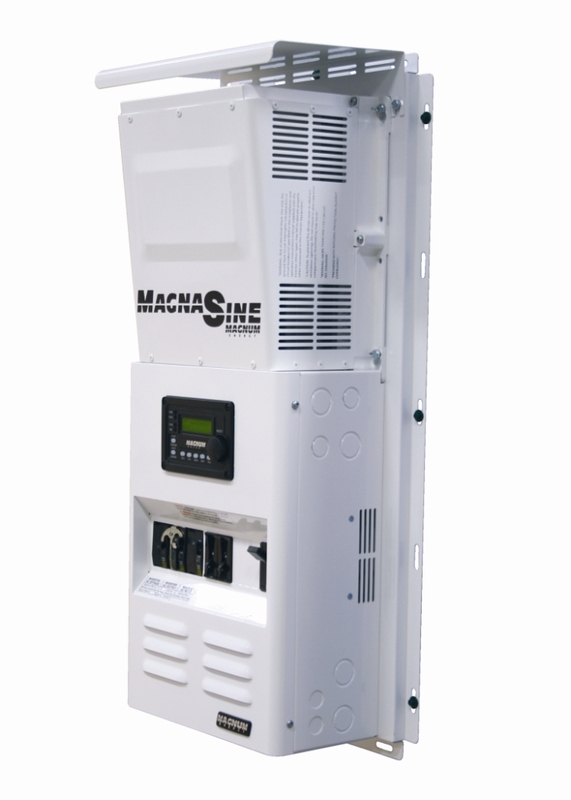 Designed for single inverter applications, the Mini Magnum Panel (MMP) enclosure, part of a line of Panel Systems from Magnum Energy. The inverter’s required AC and DC disconnects and wire connection points are all together, and integrated in one self-contained MMP enclosure. Installing an inverter system is now as simple as mounting the MMP enclosure, installing the inverter, connecting the battery bank, and if needed, bringing in AC power from a generator or the utility. 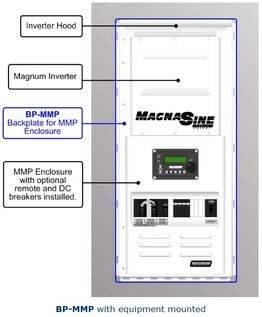 The MMP - Mini Magnum Panel - is an inclusive, easy-to-install panel designed to work with one Magnum Inverter. The MMP features a small footprint and comes prewired for fast installation. Circuit breakers and the optional remote control mount on the front of the cabinet. They are ETL listed to UL 1741 and CSA C22.2 107-01. Each MMP includes one DC breaker 175A, One AC bypass breaker – 30A dual pole or 60A single pole, input – 30A dual pole or 60A single pole, a 500A/50mv shunt, DIN rail provided for up to eight DC mini breakers. Ground Fault Protection wired in. Mini Magnum Power panel parts includes: MS-4448PAE, MMP175-30D, MMP-BP, ME-ARC50, MNDC-GFP63 (included when required) and 10 foot pair of 2/O CSA approved inverter cable pair.